Apple iPhone includes a wide range of ringtones by default that can be set based on your requirements. However, you may not like any one of them. Luckily, you can download plenty of free ringtones for iPhone from the web. Yet it would be tedious to locate free ringtones because they are scattered all over the web. Hence in this article, we will provide you a list of the top 5 legal websites to download free ringtones for iPhone in 2019. You should note that most of the websites will require you tohave an account before you proceed to download ringtones. Zedge provides not only plenty of iPhone ringtones but also wallpapers and games. You can download the ringtones free of cost either directly or by scanning the QR code. Moreover, it has an app version in Apple Store that you can download for free. However, Zedge has been blocked in some countries and hence you should find other alternatives if you can’t reach it. CellBeat provides free ringtones not only for Android phones but also for Apple iPhones. You can download ringtones for iPhone and Android devices distinguishingly in M4R and MP3 formats. The portal offers a wide range of ringtones such as Hip Hop ringtones, Country ringtones, R&B ringtones, funny ringtones, silly ringtones, and much more. The home page is divided into two sections named Most Recent and Featured. If you press the Get It button, you will be able to view the info page of a ringtone including the title, and the artist name. The site provides a total number of views and download counts, category, file size, length along with download links for Android and iPhone users. The information of the total length is important because you can opt for a suitable ringtone less than 30 seconds for iPhone. 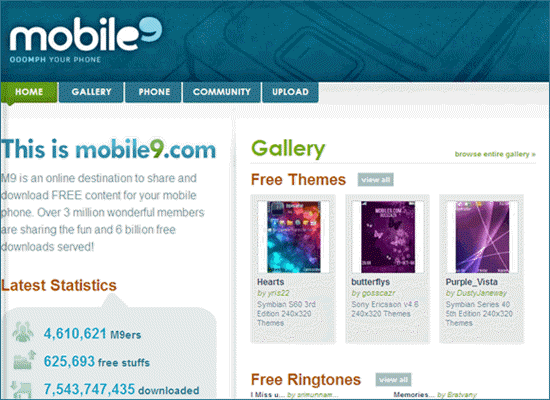 Mobile9 also provides several free apps, screensavers, mobile themes and enables you to download free ringtones for iPhone in 2019. You need to provide the exact iPhone model to explore the content. You can also download the relevant mobile apps for Android, Apple and Windows devices. However, the site is not working with the PC, and You need to download the Mobile9 app from Apple App Store to download ringtones straight to your iOS device. 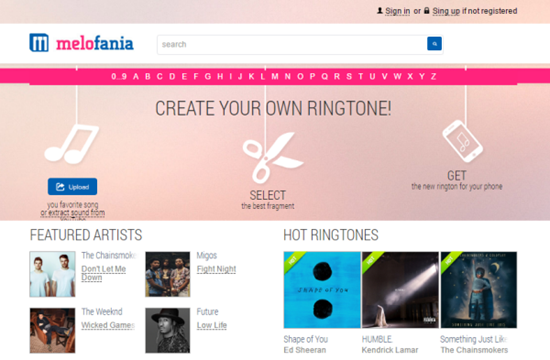 Melofania helps you create ringtones online. You just need to upload a song and select the best fragment. You can then download the new ringtone and sync it to your iPhone. The site provides featured as well as hot ringtones for your iPhone to use in 2019. With this website, it is easy to locate the ringtones just by searching for the tune, and you can also find ringtones by artists. The site also provides news related to ringtones. Freetone enables you to listen to ringtones before downloading the tones by simply clicking the Play button. If you select the title link, you will view the details of the track with file size, format and number of views. It is also possible to share the track over social media platforms. It allows you to download ringtones for free by clicking the Download button, however, you may need to convert the downloaded ringtone for iPhone by yourself since it only offers MP format. After syncing ringtone to iPhone, the next big thing is to set it as your iPhone ringtone, which is very easy just by following the below steps. 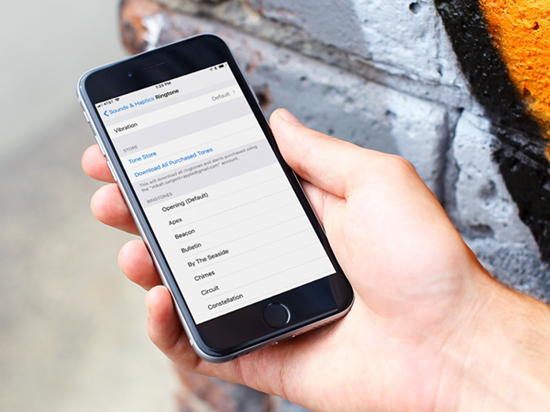 Step 1: Navigate to Settings page from the iPhone home screen. 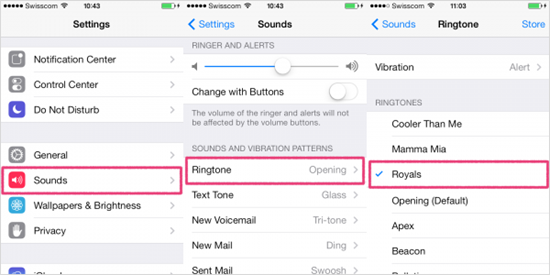 Step 2: You should select Sounds tab and click into Ringtone. Step 3: The ringtone you synced will be displayed before the default ones, you just need to simple click on it to set as custom ringtone for iPhone. Even though iPhone ships with plenty of ringtones, it would be better if you can use any one you prefer and be special. We hope this article helps you freely download ringtones for iPhone in 2019. Beside these online websites, you can also install some ringtone apps available on Apple App Store to download ringtones on iPhone.